No real stats this time. Feels bad! It’s time for a very interesting game review. The reason why I say that is because this review isn’t 100% complete. This game came in two discs and the only problem is that I don’t have the two discs. I only bought the first and I’m not about to go and try to buy the other one so I’m reviewing the game based on the first half. That’s reasonable though since the first disc has over half of the levels since the second one focuses on the multiplayer aspect of the title. It’s a fun game and feels rather polished. It may not be my favorite Bond game as that honor belongs to one that I’ll be reviewing shortly, but it is definitely a solid game in its own right. The game manages to bring together most of the biggest villains from the classic Bond films. They have all united to try and take the agent down for good which is certainly bad news for this operative. Fortunately he has the help of Agent Terry, a fighter so powerful that even 007 has to acknowledge his abilities. Together these two agents will do their best to fight against the forces of evil. Can they succeed or will they fail? It all comes down to the skills of you, the player. The gameplay is pretty straight forward. You try to shoot the enemies ahead of you and ultimately you have to survive at any cost. Your mission will typically be to activate something after you’ve cleared out the guards. You have your hand weapon when starting a level but you can also pick up weapons that are scattered across the room from the various minions. You can also engage in fisticuffs when you are out of ammo, but I can’t really say that I would advise this. Just try to have some ammo on hands so don’t waste your shots. The gameplay is quite technical all things considered and you’ll want to try and remember as much of it as possible. Also, it should be noted that this game is quite difficult. I’m not great at the FPS genre so that should be taken into account, but the levels are very unforgiving. Shots from the enemy take up a lot of damage so even with your health being able to regenerate it is hard to proceed through a level. The enemies also bring the fight to you so you can only hide for so long. It’s definitely not a game for newcomers to the genre or kids in general as they won’t stand a chance. It helps the game last longer for sure though so that’ll help it be worth the price you paid. The main game length should take you around 10 hours which is solid. There’s not really anything else in the way of replay value single player wise. There is a nice multiplayer option though so that’ll give you enough fun for a very long while. Be sure that you have the 2nd disc or you won’t be able to play it though. I’d say that the graphics look pretty good. They’re not super amazing or anything like that, but they get the job done. The levels look good and the game does give us a solid amount of cinematics which is refreshing. You can tell that some real effort was put behind this game and that’s definitely a good thing. It’s also impressive that Bond got at least 3 different games for the Gamecube. Not just any character can pull that off. It’s a little hard to compare FPS titles to each other since they’re so similar so I couldn’t tell you if this game is as good as Agent Under Fire or not. I’m inclined to say that it isn’t but it’s probably pretty close. The plot was reasonably engaging. It didn’t have as many one liners as the last Bond game, but that’s because Bond isn’t the lead so it makes sense that Terry is a lot more withdrawn. After all, he’s here to help save the day, not to trade barbs. It’s hard to say how likable the main character is either of course since he’s rather silent and doesn’t do anything but fire at the enemies. Not a bad thing, but I like when the games aren’t afraid to give the original character a little more personality than that. 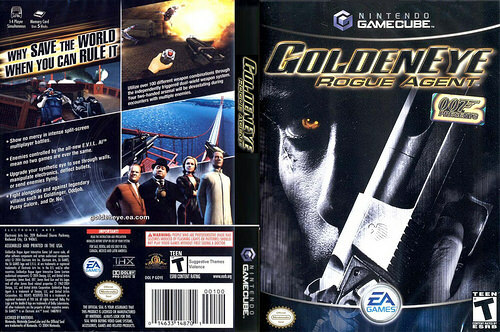 Overall, GoldenEye is a fun Bond game. It’s a shame that I won’t be able to see the ending, but rebuying the disc just doesn’t seem worth it and I’m not interested enough to look it up on Youtube either. It’s just going to have to live with the knowledge of only being worth half a playthrough. Honestly that’s not such a sad fate though right? Half a game is still better than none and at the end of the day at least you could say that the game was interesting enough to get through that. If you like FPS titles then this is a good game for you but otherwise skip it. Your enjoyment depends entirely on how you like the genre because it doesn’t try for much more than that. That’s just the kind of genre an FPS is. Looks like it’s time to take a look at Alien Crisis. This is the first Men In Black game that I’ve played and one of the only ones to have ever come out. It’s a pretty fun game and you could tell that some effort was put into it, but at the same time you can also see how the developers were a little lazy at times. There are parts of the game where there is no real explanation on how to handle a boss and that can make it last a lot longer than it really should. One boss took me nearly an hour until I realized that the game was actually showing me the wrong weak spot. That wasn’t very helpful. The game revolves around a guy named Peter. He’s a thief who used to be a respected archeologiest until he started having theories about aliens living among us. He was discredited so he decided to get back at society by stealing things. He gets in a little over his head when aliens show up, but he dispatches them with his gun skills. The Men In Black organization is intrigued so they blackmail him into helping them, but as the journey goes on, Peter starts to realize that being a hero may not be such a bad thing. It may be a brief realization though since the Earth may not be around for much longer! Unfortunately, Peter’s not a good character. He’s modeled after James Bond in a sense so while he makes a lot of good puns and one liners while in imminent danger, he also gets his undesired traits like constantly flirting and most of his lines are about that. It’s too bad that we can’t get a character who’s super confident and everything without being a flirt. Wait a minute The main heroine is the hardened agent who blackmailed Peter into joining. She’s no nonsense and keeps reminding Peter that he’s not ready for this line of work. I could have sworn that she has the same voice actor as Black Widow. She’s a good character and by default, she’s basically the best in the game. As you may expect, she’s naturally possessed at the end so the rookie (Peter) can save the day, but I guess she takes it well. If we ever get a sequel, their dynamic will hopefully be more like the duo from the original Men in Black films since Peter will have some more experience. The dog makes some cameos here and there, but his role is not as big as it could have been. There’s also a professor who tried to outwit Peter and the MIB a lot, but he always fails in the end. One thing you’ll have to think about though is whether you should be rooting for MIB or not. After all, they did destroy a guy who came to Earth for an arranged marriage as part of a truce between races, right before they murdered his partner. Well, you know what they say..Don’t Mess with Earth! The gameplay is your standard shooter, but it’s not totally first person like you would expect. You can still see your character and to an extent it can almost be called a third person shooter. I wouldn’t really call it that because you can never move forwards or backwards, but sideways is always an option. You can choose to hide behind a wall and strike out at the enemies or you can just stand tall and keep on blasting them. Either way, you should have the edge here as the enemies can’t stop you so easily. One health pack is enough to get you back to around full health although I imagine that this will change on higher difficulty modes. You have around 6 different guns and they’re all pretty useful. I really like the machine gun, but the others have their uses. The two weakest ones have unlimited ammo so you’ll go to them when you’re desperate or in a tough spot. Those two situations are almost identical though. You also have a few gadgets to help you out like anti gravity grenades that send enemies into the air and a freeze ray that can really come through in the clutch. There’s also a barrier, which I highly recommend using as it can block all enemy fire and will never shatter. If you’re low on health then there’s no reason not to use it and it recharges very quickly as well. I’m going to give this game some props for the fact that it didn’t stop at just making one gameplay style. There are several levels where you have to play in a different way in order to win. For example, there are 2-3 car chase levels where you’re flying through the city and blasting away at the aliens who are chasing you. You have to be careful not to his civilians or cars as you do and it makes for a fun level. There are also the sneaky levels which are all about strategy and silently taking down your foes. I’m always up for a stealth game even if I admit that they can be a little more irritating at times. Carmen Sandiego did this style best with Shattered Dimensions being a close second. Men In Black pulled it off quite well and would probably make it at number 3 here. The Batman games ironically get wrecked in this department. The soundtrack is a little limited, but the tune for the main menu is catchy. The other themes are mostly non existent, but it’s your usual action fare. I wouldn’t say that the themes are bad and they’re fun to listen to in the heat of battle. The audio is interesting though as some characters sound robotic at times even if they’re trying to be charismatic. Ah well, I appreciate the effort at the very least. It can be annoying to hear the dialogue sometimes though since it is set to always replay if you lost in a level. I lost to the final boss several times before finally winning and to have to hear the same lines over and over again can get really old really fast. As for the graphics, they’re perfectly acceptable. It has that cash-in vibe, but the blasts are nice and colorful. I also like the designs of the enemies. The game did a good job of adding many different species unlike Battleship and the Iron Man inspired villain was also pretty hype. I can’t say that there’s a whole lot of replay value to be found here. I read that the average completion time for this game is 2 and a half hours. I guess if you skip cutscenes and take out all of the enemies without a problem this can be true, but personally I’d expect the campaign to take you closer to 4 hours the first time. After that, you should have most of the trophies as well. The only things left to do are get the rest of them and maybe play around with the challenges a little if you really want too. I would say that the game is worth the current price although if you spent 60 on it (Not sure if this ever was 60 though. I personally doubt it) then you probably got ripped off. The only real negative that I have with the game are the boss fights. As I mentioned earlier, the game really leaves you to your own devices, which means that you need to put on your detective hat and figure out what’s happening. Unfortunately, since the moments where the boss is actually vulnerable are few and far between, it can take a while. I lost to one of the bosses over 10 times before defeating her and I still don’t know what the problem was the first time. I basically just got lucky. As for the final boss, I did figure out that I was shooting the wrong target, but man did it take a while! The bosses were certainly the weakest part of the game, but they could have been worse. 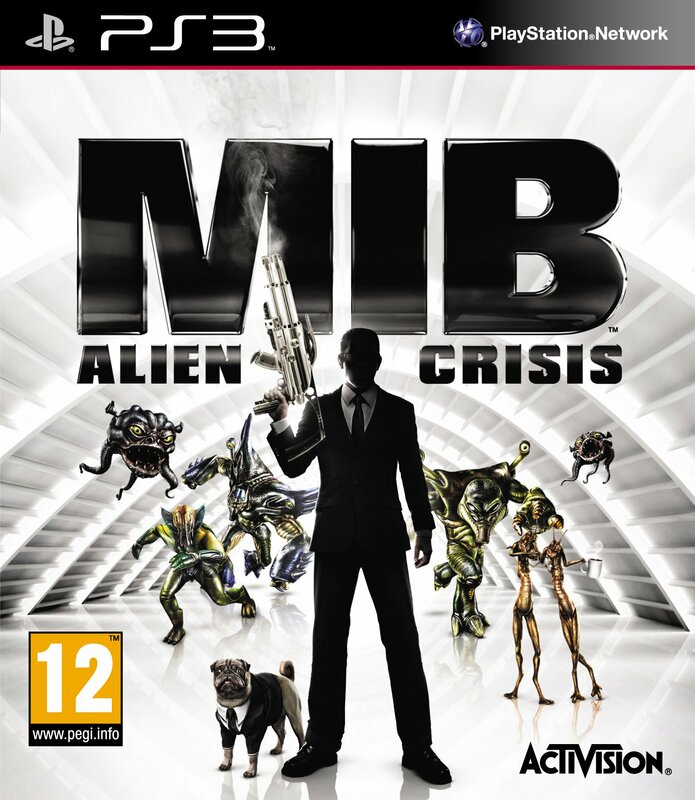 Overall, Men In Black Alien Crisis is a pretty fun shooter. I found the actual gameplay to be better than Battleship, James Bond, and several other shooters. I even preferred it to Metroid Prime although that game naturally did have a better plot and more of an epic vibe. The story mode here did feel like a decent movie though and the snappy dialogue made for a believable main character. If you didn’t know any better, you could have easily thought that the movie probably had the same plot as the game although they are completely different. The writers thought it through and made a full on story mode so props to that. This may be a bit of a cash-in, but there was clearly more effort put in than usual. I’d recommend checking this title out. It’s time for another first person shooter! TimeSplitters was pretty good so it’s safe to say that I had some reasonable hopes for this game. The level designs looked pretty intense from the back of the cover and it has a pretty sweet opening cutscene. I was all set for a pretty intense adventure, but this title is unfortunately not nearly as it could be. There’s a huge reason for this…so let’s get to it! There is no real story mode. Let that sink in for a few minutes. There is a campaign mode and their are several countries to choose from, but it’s basically just a team Deathmatch like in Transformers. You can play them in online mode or offline. Naturally, it’s been a long time since this game came out so I didn’t even bother to check the servers. I jumped into the offline battle and it’s definitely not quite as entertaining on your own. You fight the enemies, but there is no plot and everything resets once you finish the level so you can try it again. You keep the level ups, but it’s really just like playing an online match by yourself. I give the game credit for how big the levels are, but it’s not really enough to make this game a winner in my books. A story mode is a must or at least some more variety. There is seriously nothing to do in this game. I could play a lot of “multiplayer” matches by myself, but finishing one level was tough since it’s just so long. I definitely wouldn’t want to try the levels too many more times. You can optionally lower the timer to 10 minutes, but you still wouldn’t be accomplishing something. It would be another story if this game had trophies, but this was before the PS3 started giving them out to all of the games. Either way, I have a feeling that most of them wouldn’t be achievable anymore. The gameplay is rather deep for an FPS. I dare say that it may be a little too complex, but I’m sure that Call of Duty fans will appreciate how much effort was put into this. You get 5 different weapons that you can shift between and you get to pick your class at the beginning of each match. Once you decide whether you want to be an alien or a human, you get to go onto the battlefield. You want to fulfill your objectives and conquer as much land as possible. The stage is so big that the battles easily take up the 40 minutes. I ended up dying about 50 times in those 40 minutes. It’s similar to Star Fox Assault in that the vehicles are pretty overpowered. Your attacks don’t do all that much damage to them and a single hit will wipe you out. The enemy had a ton of objects at the ready to blast you with and my army felt pretty unprepared. You can also jump and duck. It’s a pretty realistic shooter as far as the mechanics are concerned. It’s also pretty cool to be able to coordinate such a large army and it’s like a beat em up, but without the fun parts. (The beating everyone up in fluid/fast gameplay that makes everything exciting. The graphics definitely hold up rather well. A lot of detail has been added to the game and considering that this came out about half a decade ago, it holds up well. The enemy attacks really look cool and the opening is definitely something that will catch your attention. It’s very realistic, which works for the setting that this game has. I think the grenade explosions could be a little better, but this will have to do. There’s not much of a soundtrack here to speak of. It got lost in all of the shooting that was going on! This game could have easily scored a 7 with a decent story mode. At least give us a 1 on 1 option for some local multiplayer! There really isn’t anything wrong with the gameplay and the levels really give you a lot of options. You can swim so you can go around the enemy base through water or you can set up ambushes in a factory. This game is really extensive and you could certainly make some real plans as long as you got the microphone for the PS3. On your own, none of that is an option and the game loses over 95% of its replay value. Fighting against computers isn’t very exciting and there are no real rewards, which also takes away the incentive of playing it. A game should always prioritize story mode over the online functions or at least make sure that it is a reasonably good option. This game had a lot of potential, but it ultimately blew it. 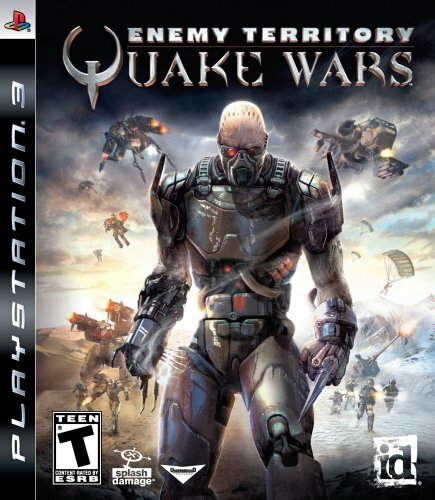 Overall, Quake Wars was definitely not as good as TimeSplitters. At its peak, I’m confident that it will have still lost since I preferred the gameplay in the futuristic title. It may have been rather simplistic, but that’s definitely okay for an FPS. The speed of the gameplay was important as well. Quake Wars is a dependable game if you just want to earn exp on your own against some computers, but know that there isn’t anything to do with it. It’s like questing by yourself in an MMO with no story and no ultimate goal. For that reason, this game is almost unplayable. You can definitely get it for a low price, but if you want to play a real FPS, check out Agent Under Fire for Gamecube! Now that is an FPS with a story that also contains a very solid multiplayer alternative. It’s time for a new series to join the ranks of the blog! Starting a game series always fills you with a lot of emotions because you are about to be thrown into a whole new world! Who knows what dangers lurk around the corners and which games will end up becoming instant classics. 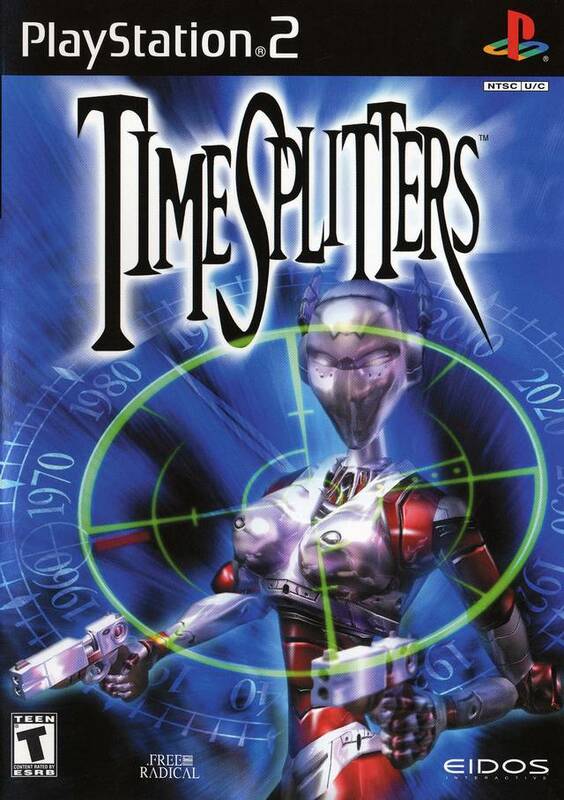 TimeSplitters is an FPS with a sci-fi theme so let’s see how this plays out. What does FPS mean? Basically, this game is a first person shooter similar to Call of Duty. It’s not your average shooter though because it has an arcade feel to it. So, the gameplay is very quick and you’re always on the go. Tactics aren’t really going to save you from getting blown apart so my best advice is to just run at the villains. Simply fire before they can fire back as you dash towards the goal. There are 9 levels in Story Mode and each one can be beaten between 30 seconds to 4 minutes. According to the play time, I took a little over an hour to beat it. “So what happened DReager1…did you hold back?” Well, that’s the logical assumption to make since the game should have only taken me around 36 minutes to beat considering my epicness. The big twist is that I’m not very good at FPS games. Don’t get the wrong idea! I could still take just about anyone out in this kind of game, but I simply can’t deal with the sniper gun. That’s the level that I tried around 40 times before finally completing it. Over 40 times!! Even if the levels are short, that’s certainly going to keep the clock running and I eventually just muscled my way through. It was tough, but no level can hold me at bay for long. There is technically a plot, but it’s only in the booklet or on the cover. The actual game doesn’t really have one so I won’t really address it here. Once you are done with the story mode levels, you unlock Challenge Mode. I believe that there are around 18 challenges so that should buy you some more time and we can’t forget about Arcade Mode! The game also goes up to 4 players, which is pretty good since multiplayer is a must in any FPS. People don’t spends thousands of hours playing Call of Duty and Halo for the story mode…they play it for the huge online battles! Likewise, you’re bound to have a lot of fun in multiplayer playing this game since competing is always fun. The soundtrack is decently good for this game from what you can hear. Amidst all of the shooting, you’ll likely only remember the main menu theme. It’s pretty good, but I would have liked to see some other themes as well. Of course, when you beat a level in under a minute…you may not be giving it enough time to really get going. The graphics are pretty decent for this game. The character models don’t look too blurry or anything like that and you can clearly see where to go next. Considering that lighting is typically a problem on my TV, it was impressive to be able to see everything. The level designs are a lot of fun and my favorite level is easily the mansion. Surprisingly, the future levels tended to be the least imaginative. Maybe I just didn’t like playing as the robot, but it wasn’t quite as exhilarating as being in that huge mansion. First Person Shooters have been one of my least favorite genres. I used to really not like them and part of the reason is that you really can’t focus on the scenery in those. You’re always looking at the screen through the barrel of your gun and it can be tricky. I’ve grown more accustomed to them over the years though, but my skills are still a little behind since I rarely play them. I enjoy the game’s fast pace since it helps it feel a little more like your typical third person game. If you are just entering the FPS world, this may not be a bad place to start! Overall, This is a pretty fun game. You’ll definitely enjoy it if you like the FPS genre and there are a ton of characters to use. It may not matter so much to some fans since you can’t really see the character during the game, but a lot of them have some pretty intriguing titles. “PeakABoo Jones” comes to mind. The only reason why you would want to think before you purchase this game is the duration. 1 hour for story mode isn’t a whole lot of time and considering that Challenge Mode is double (2 hours) the time and Arcade Mode is likely another hour, you’re not looking at a very long game. Still, the going price for it is very low and you must count the multiplayer replay value as well. Simply put, you’ll enjoy this game more if you have someone to play it with. I would still recommend it if you are by yourself too of course, but then you’ll want to make sure that you don’t mind short games. (I usually get thrilled to see a short game since I have so many on the back burner.) I can safely say that the sequel is naturally on my list now since it can only improve and it’s on the greatest console of all time….the GAMECUBE! It’s supposed to seriously give you the chills so I look forward to that. As far as creepiness goes, the zombies/TimeSplitters in this game were pretty intense. I hope that there is more of a plot in the sequel since it should help to make the story mode a little more interesting. We do need to raise the stakes right? Maybe you’ll keep this review in mind for the next rainy day so that you can have this game at the ready. It’ll be like watching a quick scary movie to pass the time by. Who would have thought that I’d be playing a James Bond game eh? While the films leave much to be desired; the concept is pretty good for a video game. This one is actually a First Person Shooter, which is the first time I’ve played one since Metroid Prime if I recall correctly. It’s not my favorite genre, but as long as it’s better than the Eternal Ring…it should be fine. Let’s see if the game had what it takes! The plot involves 007…AKA James Bond as he undergoes a mission. See, detailing the plot for anything James Bond related is tough because there are numerous plot twists and changes that occur during the story. You can’t really say who the main villain is without spoiling the character and the history behind it. Either way, it’s not ultimately important because the game doesn’t even have an ending. After you blow up the building (With a big character still inside) the game abruptly ends. I suppose that there is no longer a threat so it can be an “ending” in that sense, but it feels really sudden. The ending just comes out of nowhere and hits you like a flash. While the plot is forgettable; the cutscenes will stay with you for a while. James Bond continues to make many wisecracks and one liners in these scenes. Some are pretty clever like what he says when one of the villains falls in a vat of acid. Others just remind me why I don’t like James Bond. He can never take his mind off of pleasure. It also leads to his demise more times than not. One of his allies suckers him into going to the base because he put a hologram of a shower with someone inside. Another person hired a lady to jump into a pool and when Bond rushed out to appreciate the view, he got tackled from behind. Bond never seems to learn from these mistakes as he’s back to normal in the next cutscene. The voice acting is pretty good and Bond definitely sounds similar to his voice in the films. There are other characters in the game, but none that are really memorable. This is a James Bond game after all! I could have done without the romance in the story, but it’s James Bond so I was prepared for it. The FPS gameplay is about what you would expect. It can be a little hard to remember that the C stick moves you horizontally and I fell a few times from it. One can still jump, crouch, and use a lot of gadgets aside from the gun. FPS definitely isn’t my main style, but it could have been worse. Metroid Prime definitely wins with pure gameplay, but Agent Under Fire managed to stay fun through the levels. Aside from the shooting aspects, there are also a pair of levels where you get to drive in a car. Naturally, this was the most fun part of the game. The gameplay was really good for this part and it felt like Need For Speed, but even better. (My problem with Need For Speed is the lack of actual speed) You really got to zoom in these levels and the various weapons on the car made it fun as well. There are 12 levels in this game. That’s not a whole lot and most of them can be finished in a few minutes. In that sense, it’s definitely a lot shorter than De Blob. (Another short game) It took me two sittings to finish all of the levels, but it was a considerable amount of time because of the later levels. There are rarely check points so if you lose; then you usually have to go back to the beginning. That can be tough after a while because of how long the levels can feel. I definitely could have used more check points in the game. A slight negative would be how vague the game can be at times. It took me a while to figure out that I needed to use my jetpack to get to the final boss and blowing up the ceiling with a rocket launcher that I didn’t even know I owned was another challenge. I randomly got lost a few times as well. Maybe this helps the game to be a more complete experience, but they could have added more details. I know that I’ve been giving just about everything a lot of props for the soundtrack lately, but it’s just my good luck that the themes have been so good. James Bond doesn’t disappoint with the fun tracks and we have the classic one from the films, but also a great danger theme. When you run into some minions; the theme will quickly pop up and it’s a very fast theme that’s fitting for battle. It reminds me of some of the themes from the original Spider Man game for Gamecube. 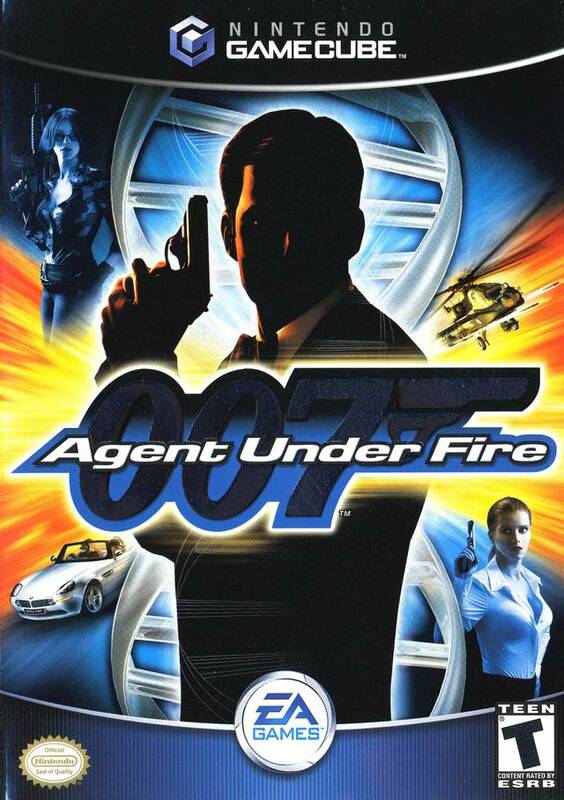 Overall, Agent Under Fire wasn’t a bad game. The car levels were a lot of fun (I wish that there had been more of them!) and the FPS mechanics weren’t bad considering that I’m not usually a big fan of them. The story may not have been memorable, but the cutscenes were pretty fun at times. (Some much more than others. Naturally, I could do without the romance) I definitely recommend this game to all fans of Call of Duty and you should enjoy it if you’re looking forward to a good secret agent story.